INTRODUCTION: Colorectal surgery has classically been associated with a high rate of surgical site infection (SSI) due to the contaminated nature of the operations. The most recent National Nosocomial Infections Surveillance (NNIS) System Report indicates overall rates of 11.3%. However, other investigators have reported rates as high as 26%. It has been proposed that the Pfannenstiel incision may provide superior outcomes to other common incisions including reduced SSI rates due to increased blood supply of the wound. The aim of this study was to evaluate the use of the Pfannenstiel incision in reducing SSI rates after laparoscopic-assisted colorectal surgery. METHODS: We retrospectively reviewed all cases of laparoscopic-assisted colon resection performed at a single, academic, tertiary hospital from 10/2002 – 9/2008. Patients were categorized based on their type of incision; either Pfannenstiel or vertical midline. 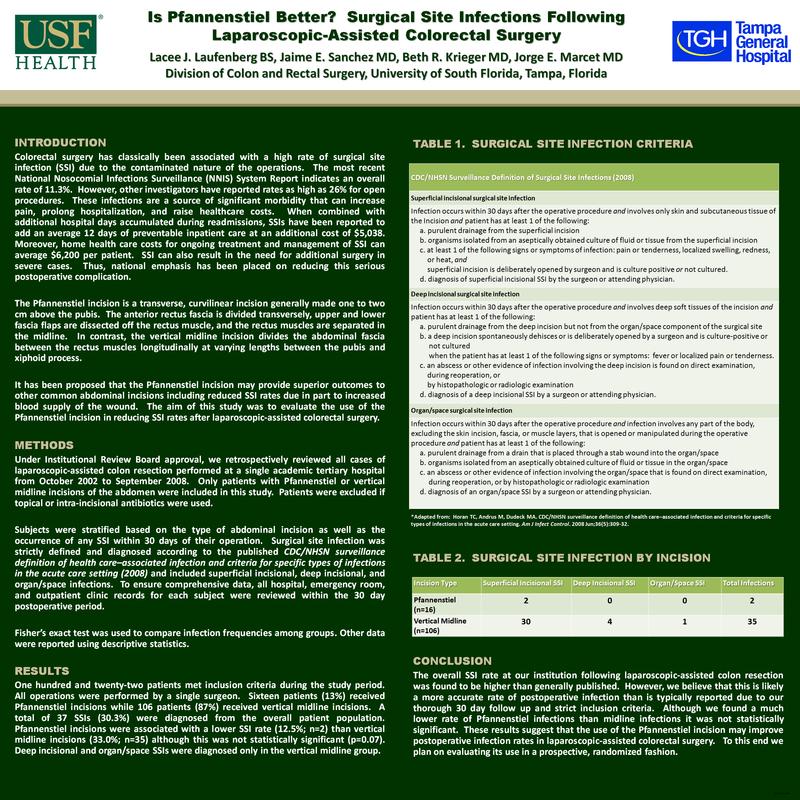 Infections were classified according to CDC definitions of nosocomial surgical site infections. Rates were then calculated based on 30 day follow-up and included data from initial hospitalization, readmission, emergency room visits, and outpatient clinic visits. Fisher’s exact test was used to compare infection frequencies and other data were reported using descriptive statistics. RESULTS: We report on a total of 123 patients. Sixteen patients had Pfannenstiel incisions and 107 patients had vertical midline incisions. Our data demonstrate an overall SSI rate of 30.8%. Patients with Pfannenstiel incisions had an infection rate of 12.5% whereas patients with midline incisions had a rate of 33.6% (p=0.07). CONCLUSION: The overall SSI rate at our institution following laparoscopic-assisted colon resection was found to be higher than previously published. However, we believe that this is a more accurate rate of postoperative infection than is typically reported due to our thorough 30 day follow up and strict inclusion criteria. Although we found a much lower rate of Pfannenstiel infections than midline infections it was not statistically significant. This may be due to the low number of Pfannenstiel incisions in our study. However, these results suggest that the use of the Pfannenstiel incision may improve postoperative infection rates in laparoscopic-assisted colorectal surgery and should be further investigated with a larger sample size and across multiple centers.